Screen grab from a chase cam session with Stefan Söderlund – Sweden. 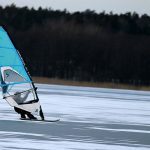 When it comes to windsurfing sails for Ice boarding the choice is simple but at the same time quite complex. 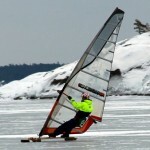 From start any windsurfing sail/rig will do just fine on Ice. Thats great because you can use your old dusty windsurfing rigs from your garage or buy a used windsurfing rig for 200-300 Euros, and you are good to go. 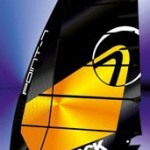 Generally a windsurfing sails for water and black frictionless ice is quite different. However when you are ice-boarding on ice with snow or if the ice is rough you will need quite a large sail to power through the bumps/snow. 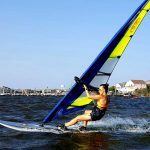 A modern windsurfing sail tend to have a lot of built in twist and at speeds several times the wind-speed a ice boarding sail with a lot of twist will only create drag. When ice-boarding you will prefer a sail with a tighter leech. 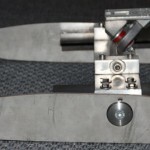 To obtain that most ice board riders would prefer older sails with less built in twist. Another solution would be to experiment with the sail and mast combo, for example matching a hard-top mast with a windsurfing sail built for a constant curve mast. Less downhaul than recommended will also help to keep the leech tight. As I said above, if there is snow on the ice or if the ice is rough you will need a large sail to keep the speed through the snow. 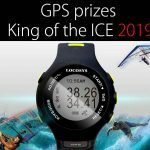 However when it comes to black frictionless ice you will go at speeds several times the wind-speed, a large sail under those circumstances will create drag and you will loose top-speed. Most used sizes in sweden I would say is 5.0-5.5 sqm. 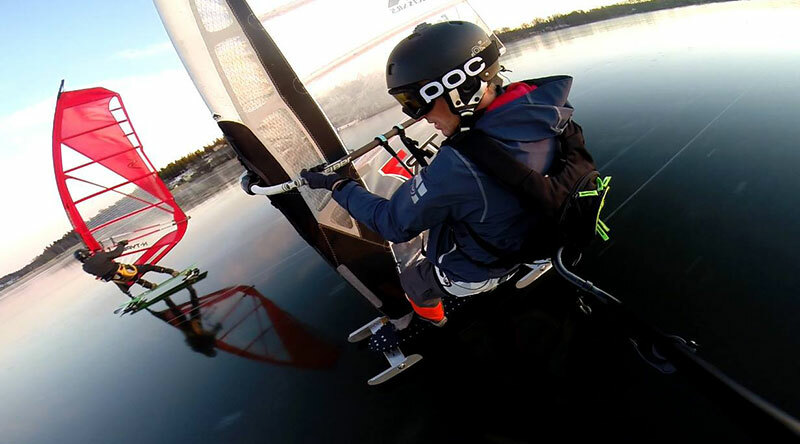 Jeff Brown and his buddies in the US use specially designed sail for ice boarding, often sails as small as 3,7 sqm, and its no secret that they are very fast over there. 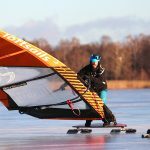 Wave / freeride sails vs Camber sails on Ice? The question is quite hard to answer. If you talk to the Swedish riders there are at least two different schools. 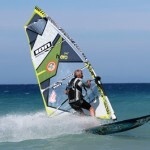 Quite a few riders uses small camber sails, others uses small wave sails. The interesting thing here is that the speed potential seems to be quite similar. 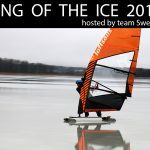 Its just a question of time before both categories of ice board sails will hit over 50 knot in Sweden. Dean Withrow from the US has a personal best of 53 knot sailing with a Maui Sails TR6, 4.7 sqm. 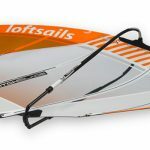 As you may have noticed, reading through the article above, there´s nothing called the absolute truth when it comes to iceboard sails. I would guess that learning to know your sail will make a huge difference how it will perform. 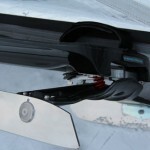 One or two cm more or less (more likely) downhaul can give you the 5 extra knots you need to outperform your buddies. 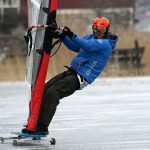 Feel free to have your say about Ice boarding sails. Together we are stronger! Hopefully we will have Møre days with ice this year. 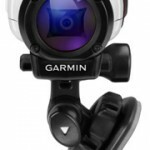 The big question is will the Gear be ready?